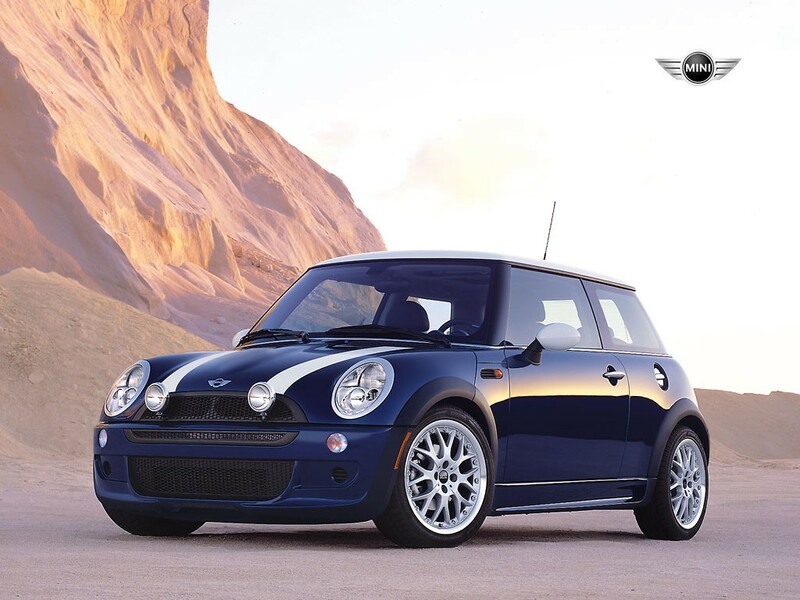 Are you passionate about your MINI? Just can’t get enough of it and hate to leave it in the garage or on the street at night? 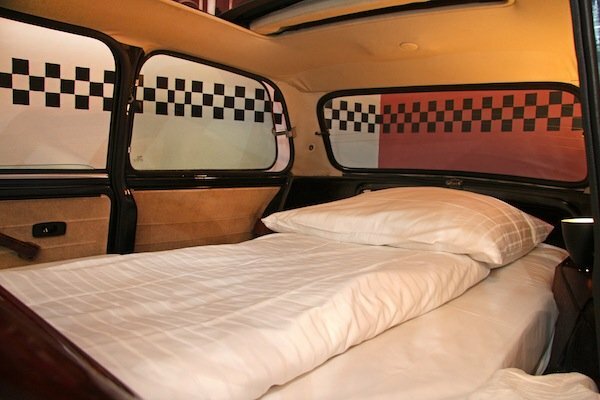 Would you even sleep in it if you could? 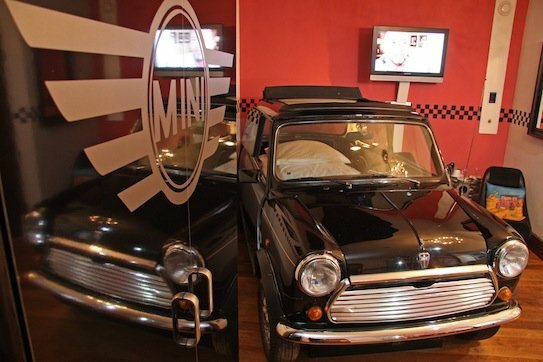 If you’re seeking the dream locale where you can lay your die-hard MINIac head to rest, there is a room out there for you. 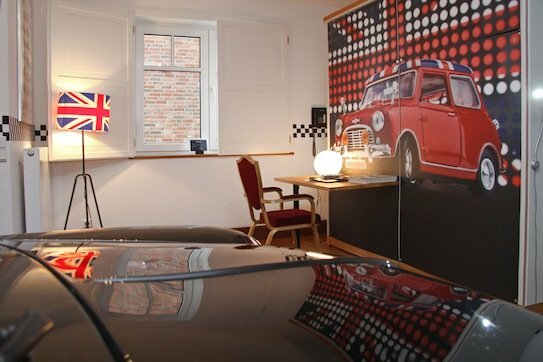 If you happen to be in the area of Munster, Germany, the “Mini Cooper Room” is just a hop, skip and a jump away (or around a 25-minute drive on the Autobahn). 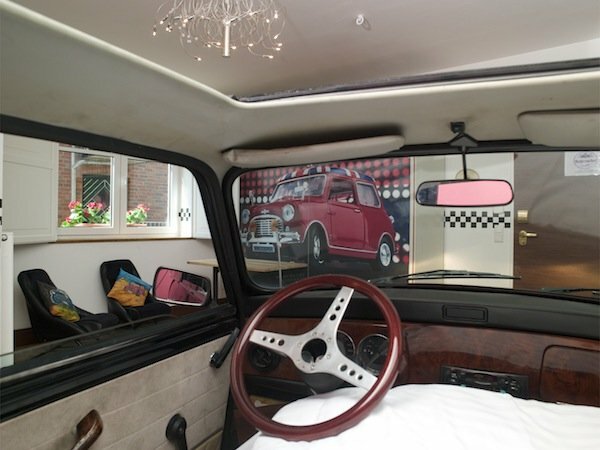 Decked out in MINI memorabilia and dedicated entirely to the beloved British heritage brand, you can slumber in a black Classic Mini, retrofitted to host a comfy bed rather than its famed leather seats (which are now used as chairs in the room itself). 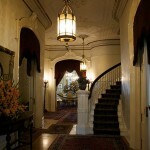 Ah, luxury. Drop the top of this classic cabrio and get ready to dream sweetly of your most memorable road trips. 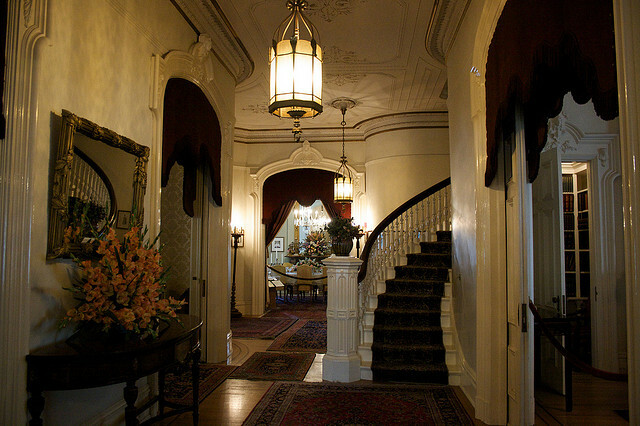 Oh and if you’re afraid of the dark, switch on the pair of built-in nightlights. Just reach behind the three-spoke wooden racing wheel and find a bedtime buddy in the still-functioning headlights. 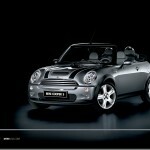 MINI Cooper S Herpa train set. Are you a collector; do you collect model cars or model Train Sets? What about both? In the model train community, Herpa has become more than just the world‘s market leader for car and truck models. Since the International Toy Fair 2003, Herpa has surprised the collector’s community time and again with its lavishly designed train sets.They have become gems, providing new impulses to the model train business as a whole. In the 1/87 scale (HO), a number of very special train sets have already been produced in close cooperation with Märklin/Trix – all sold out within almost no time, and gone down in history as rare and popular collector’s items. The successful “Mercedes Silver Arrow” set was followed by the“Hochtief building site transport train”, and Herpa “Maybach – a classic of the future” train set. Thanks to the great partnership between BMW and Herpa, another classic was created – and a MINI one in all respects: a complete car transport train set in the 1/160 scale (N track). 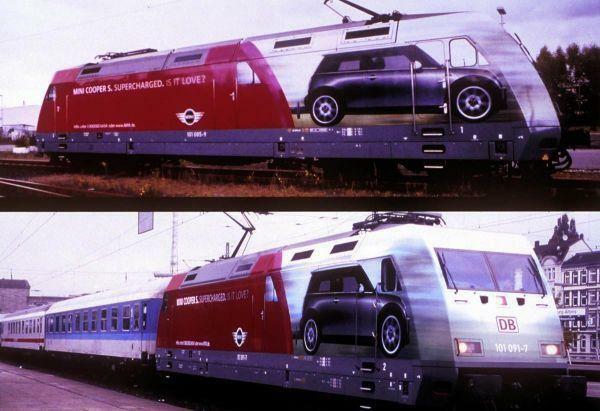 The Taurus locomotive carries the promotional design that was used when the MINI Cooper S™ was first introduced. Herpa was licensed to produce this special locomotive in the 1/160 scale. The locomotive and the transport cars were made by Märklin/Trix, while Herpa contributed the N-scale MINI Cooper S™, which was a new type in the 1/160 scale. 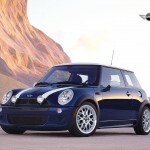 The twenty-four miniature car models were designed with loving care, and came in six exclusive colors, and made the MINI Cooper S™ car transport train a real highlight of every diorama or glass cabinet. 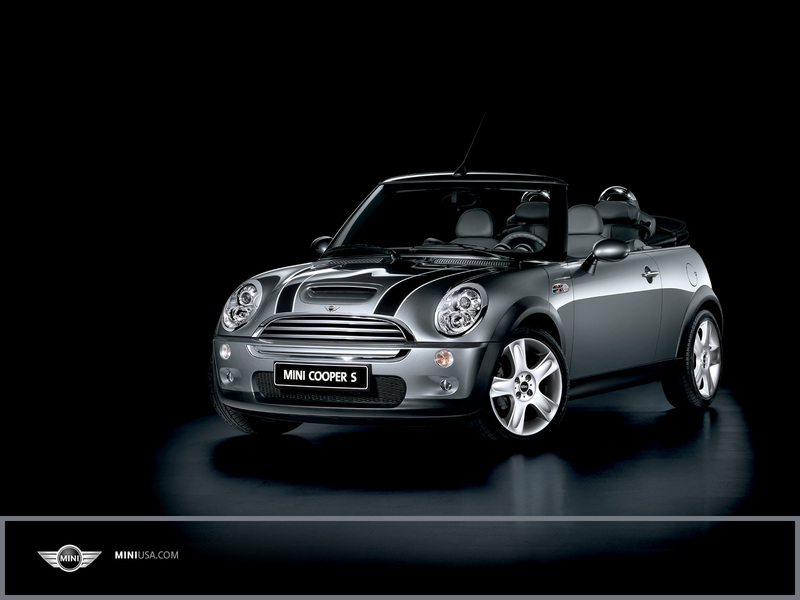 The MINI Cooper S™ car transport train came as an exclusive limited edition of 750, and was available through toy and hobby shops around the globe in November/December 2004. 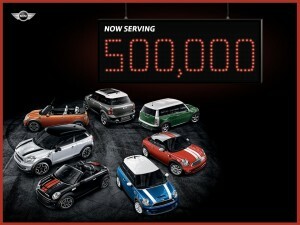 MINI USA announced today (April 2, 2013) that it’s official: MINI has sold its 500,000th vehicle in America. 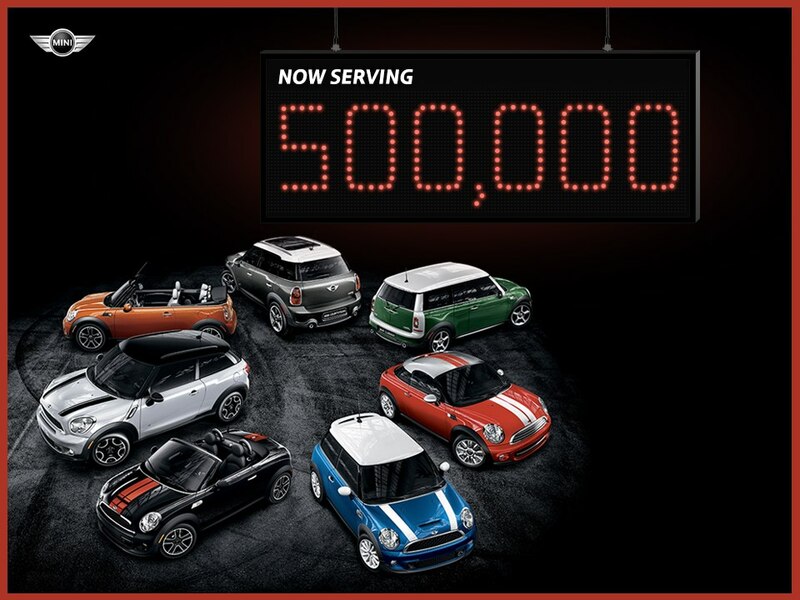 Just a few days after the 11-year anniversary of MINI’s launch in the USA, and the introduction of the all-new MINI Paceman (the seventh model in the lineup), MINI USA welcomes its 500,000th new car owner. Way to go USA and welcome #500,000! In a world first, three dogs have put some humans to shame, driving safely down a race track and negotiating hairpin turns. 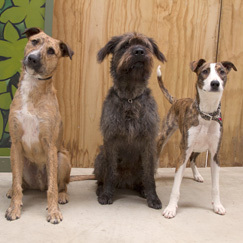 The trio of misfit mutts from the Auckland SPCA successfully put their paws in the 10 and two position and drove a Mini Countryman solo down a race track in Auckland live on national television this evening. The stunt, aired on Campbell Live, was part of a months-long campaign to show that dogs don’t have to be pure bred to be intelligent and encourage the adoption of dogs in SPCA care. 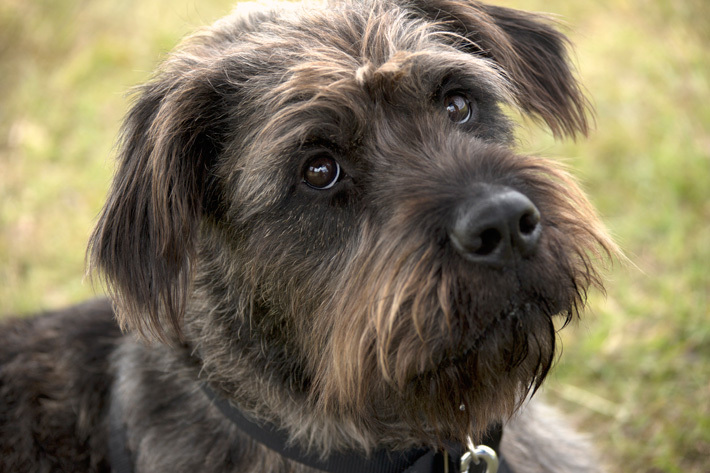 Monty, a giant schnauzer cross, Ginny, a beardie whippet cross and Porter, a beardie cross, have been featured in media across the world, even providing inspiration for the Top 10 on the Late Show with David Letterman. The dogs have also made headlines with the BBC, the New York Daily News and New York Times, as well as the Guardian and the Daily Mail, and science blogs from international journals Live Science and the Smithsonian. Monty was the first to successfully complete the task, starting the car, putting it in gear and then driving it 70 metres before bringing it to a stop. Po rter then drove a reporter around a 180 degree hairpin turn, although it wasn’t without a bit of drifting. The camera crew may have proven to be a little too much for Porter who veered slightly off the track and required a small amount of assistance, although trainer Mark Vette assured viewers he had “done it beautifully” in the past. Vette and his team have been training the dogs for the past 12 weeks. Vette has trained animals on a number of major movies including Lord of the Rings and The Last Samurai. 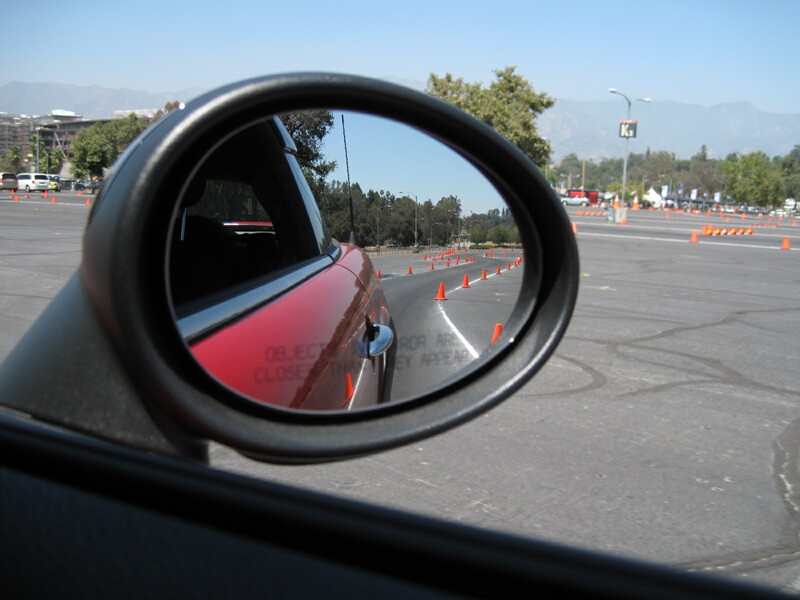 The dogs were carefully selected and underwent five weeks of simulated training to teach them to how to brake, shift gear and steer – being plied doggy treats along the way. After just seven weeks the dogs were ready for a real car. A SPCA spokeswo man said there had been “considerable interest” in adopting the dogs. “There have been many applications and the team are assessing those because the point is not to just find them a home, but find them the right home.” She said there still 44 more other “smart dogs” who were all waiting for adoption as well. 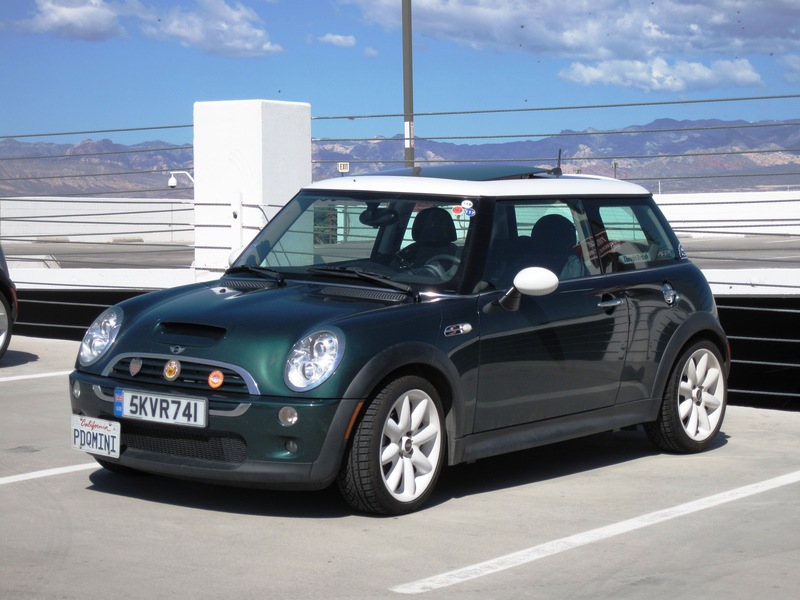 Have you been waiting breathlessly to find our if Porter from the Society for the Prevention of Cruelty to Animals (SPCA) drove his MINI Cooper in New Zealand today? 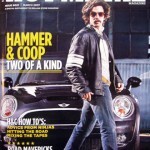 So what you say to someone named Porter driving a MINI. Not so fast; Porter just happens to be a dog. The SPCA in Auckland decided to teach three shelter dogs how to drive to dispel the idea that abandoned pets are second-rate. Dogs work as shepherds, lead the blind, and conduct search and rescue missions. And now it looks like they could be grabbing chauffeur jobs as well. 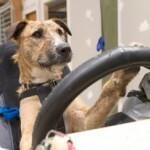 To prove t he value of the abandoned mutts it takes in, New Zealand’s SPCA taught three of them to drive a car. The site drivingdogs.co.nz redirects to a Facebook page showing the dogs behind the wheel, and explaining how they were trained. It also suggests adopting these smart companions. The car, a Mini Cooper Countryman, has been modified for hand, or rather, paw, control. 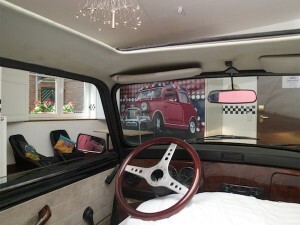 The brake and accelerator are up high, just off the steering wheel. The shifter and steering wheel have been padded to make it easier for the dogs to control the vehicle. Videos on the Facebook page show how the SPCA modified the car and how it trained the dogs, first using a stationary rig. Video of a dog named Porter, shot on a closed course, shows the dog successfully driving the car up the straight, around one corner, then bringing it to a stop. 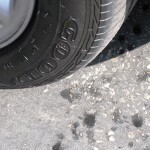 A trainer walks alongside the car, giving directions, and it is clear the dog is following the commands it has been taught. But it is impressive that Porter manages to distinguish directions for using the shifter, turning the wheel, and hitting the brake. And as soon as Porter and his co-drivers develop an independent sense of the cause and effect of the car’s controls, the cats and postmen of New Zealand better keep on their toes. 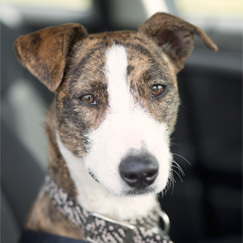 Check out the videos, and consider adopting a dog, at drivingdogs.co.nz. 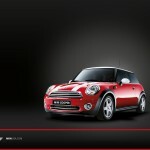 The Society for the Prevention of Cruelty to Animals(SPCA) has teamed up with MINI Cooper in New Zealand to teach three dogs how to drive. The Auckland SPCA hopes to dispel idea that abandoned pets are second-rate with the social campaign. “Obviously, we think dogs are pretty smart and amazing. And we reckon, if more people thought the same, more of our dogs would find happy homes,” the official Facebook page states. 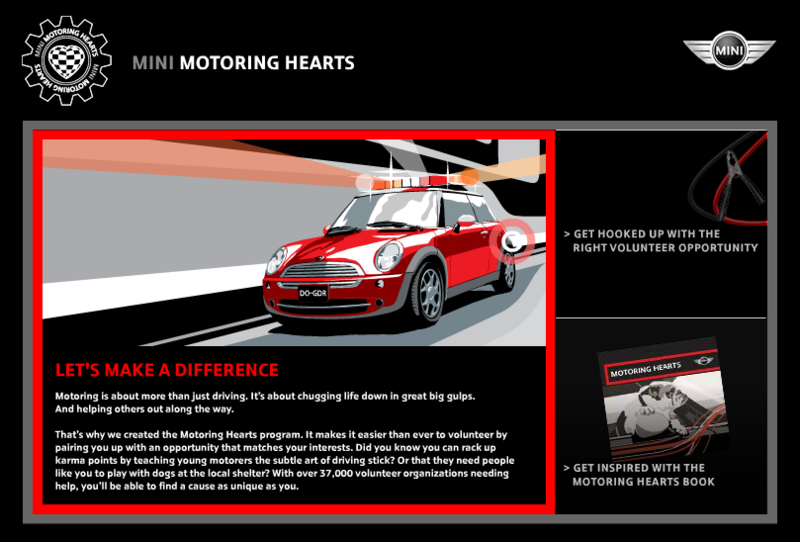 The interactive marketing campaign lives on the Driving Dogs Facebook page where visitors can learn about adopting a smart dog and about the MINI Cooper. 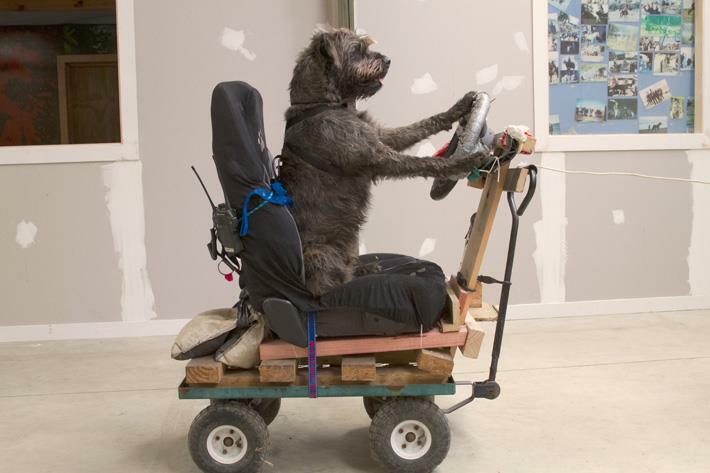 The chosen pooches — Porter, Monty and Ginny — are learning to drive in rigs with paw-activated accelerators and brakes. Trainers chose the canine trio based on their size, look and attitude from dozens of dogs at the shelter. After just a few weeks of training with head driving coach Mark Vette and his team of experts, the playful pups learned to sit facing forward with their paws on the steering wheels. The rescue dogs will be put to the test in front of Campbell Live’s national TV audience — under the supervision of trainers, of course. 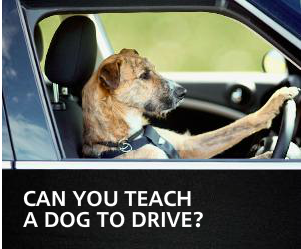 To find out if these talented pups learn how to drive, tune in on Dec. 10. In case you were wondering all three of the canine drivers are still up for adoption. All the new drivers are shelter dogs: Monty, an 18-month Giant Schnauzer, was given to the SPCA when he became too much for his owner to handle. Ginny, a 1-year-old whippets cross, was rescued from an abusive home. 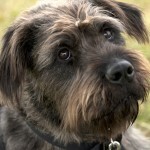 Porter, a 10-month old Beardie cross, was abandoned on the streets. The dogs trained for several weeks before hopping into a real car, modified to accommodate the unique needs of a canine driver. So far, the animals have driven only with some human guidance, in the form of verbal commands and the occasional steering wheel readjustment. Probably best to keep off the roads on that day. 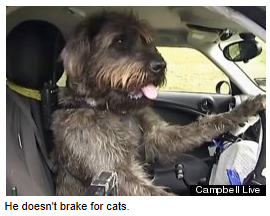 Since Campbell Live showed them driving cars on Monday night’s programme, the dogs have featured on the David Letterman Show, the BBC, the New York Times and the Huffington Post. The video reached number one on the BBC’s most watched video and most shared video lists. Tonight the famous trio joined John Campbell and Tristram Clayton in the studio, with one dog seeming to take a particular liking to John. 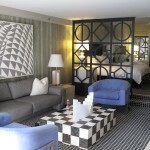 We packed our ever-expanding luggage, goodie bags and MINI shopping loot into the boot and headed down Sunset Boulevard to where it meets the (PCH) Pacific Coast Highway and our ultimate destination, Gladstones in Pacific Palisades. 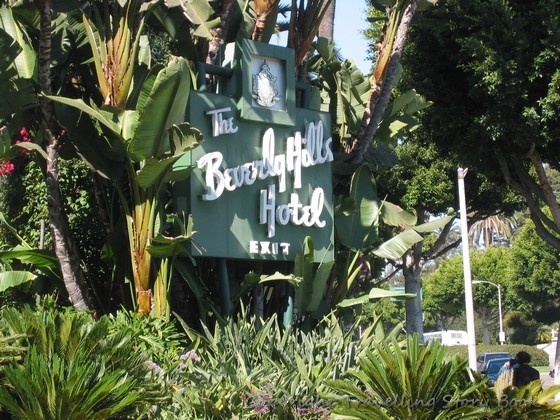 Along the way we drove past the very well-known Beverly Hills Hotel sign, the infamous corner of Bundy Drive and Sunset in Brentwood, one of numerous shield-shaped brown Hollywood signs and of course various other iconic symbols of the area. The drive was quite enjoyable with lush greenery and nicely landscaped yards but I must say, I was rather surprised to see how bad the pavement was even in Beverly Hills! Goes to show how broke the State really is. Bridget was quite adept at the dodge and weave manuever since she was from Beverly Hills after all. Who knows, it may have been like going home for her. We arrived at Gladstones and was motioned into the very large parking lot. 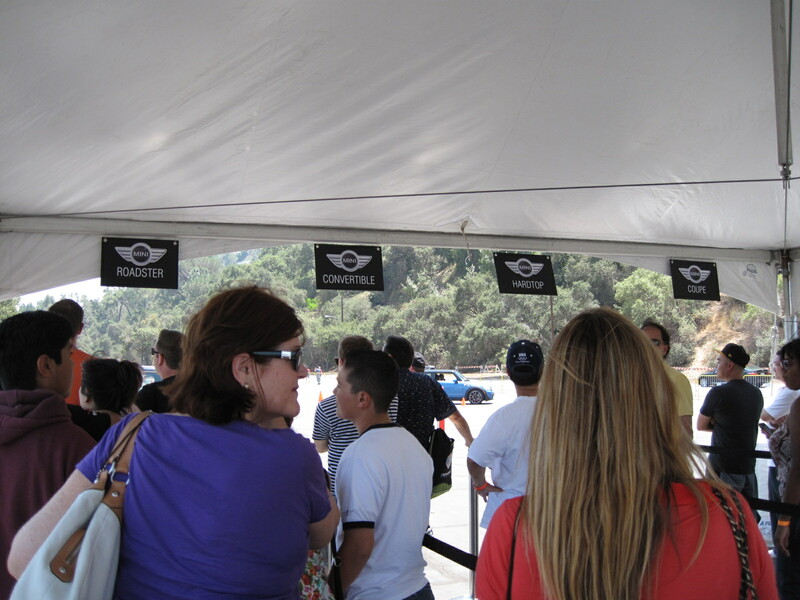 The first thing we noticed was that the “regular” valet guys were sitting in the key shack and staff dressed in MTTS Event shirts were coordinating parking. 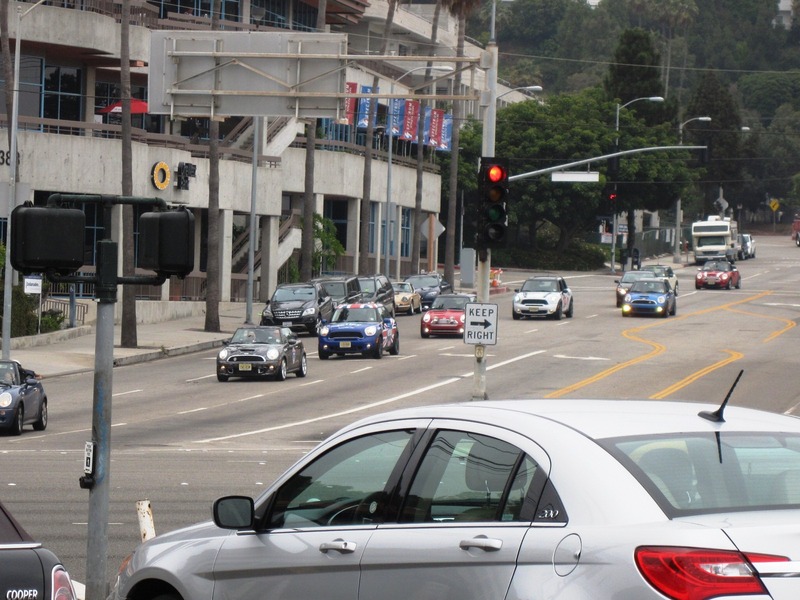 As they waved us into position, we noticed that parking angles were really strange. 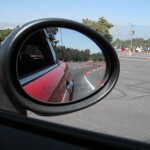 The MINI in front of us was in straight alignment but the one in front of that was at a strange curvilinear angle. I was wondering just how long the MTTS guys had stayed at the Wrap Party the night before? After parking we noticed that shopping was once again offered and one simply cannot pass up MINI swag. As we walked towards the MINI tables, people just started shoving stuff at us as they did not want to pack it up and carry it home. It was fantastic! 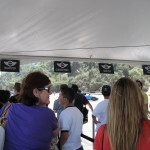 As more MINIs and Motorers began arriving we wandered around the parking lot checking out the various cars. Walking forward from where we had parked, we noticed that only the middle section of the parking seemed to be in disarray. 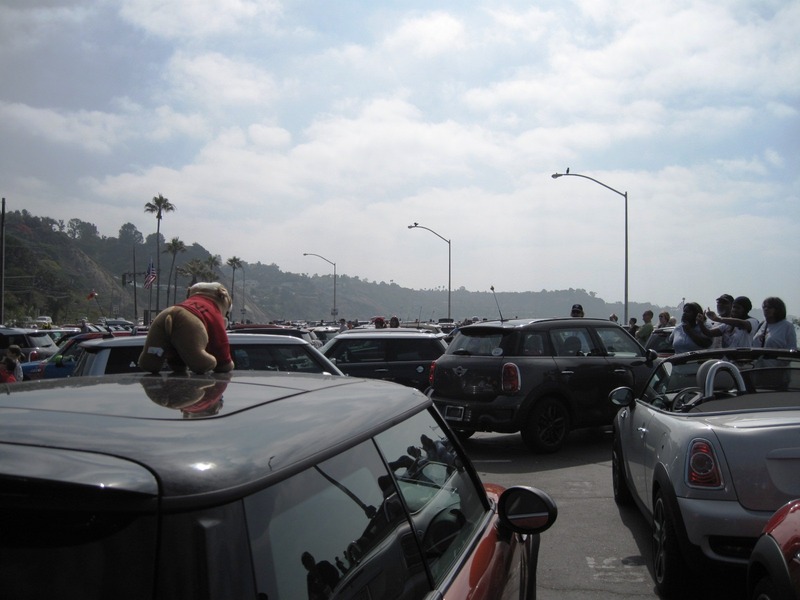 Upon reaching the top of the parking area we then noticed that the cars had not been parked straight acro ss in a line, but rather dropped a car as the rows progressed; and then it hit me – it was the MINI wings! We were being parking in the MINI wing formation. I could not see the full effect from the ground but just knowing that were we “sending a sign” to those viewing from the hillside across from Gladstones gave me goosebumps. 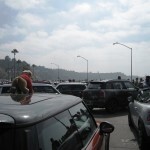 As we walked back towards Gladstones we saw a really cute sight; all of the little MINIs coming down Sunset Boulevard. 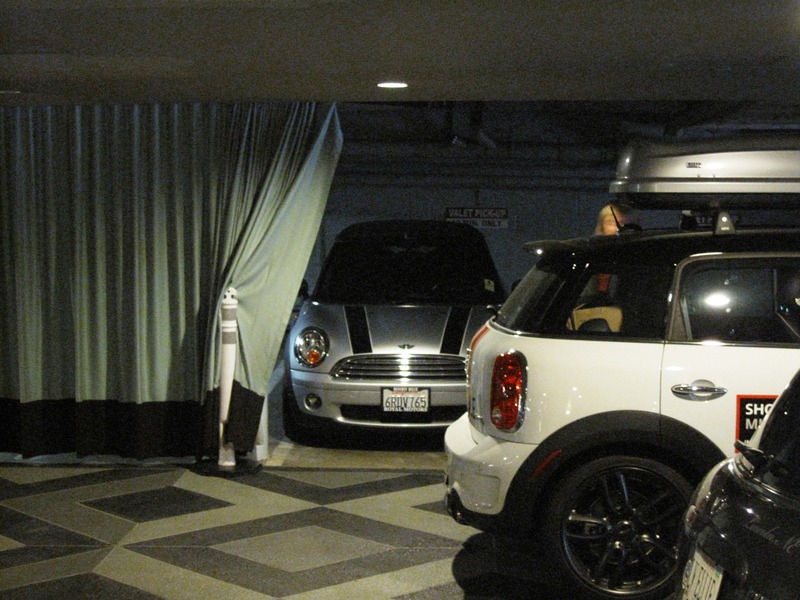 Only MINI owners understand the excitement of seeing a gaggle of MINIs flying together. Even now it nearly brings a tear to my eye. And then, we actually saw “THE CAR”. 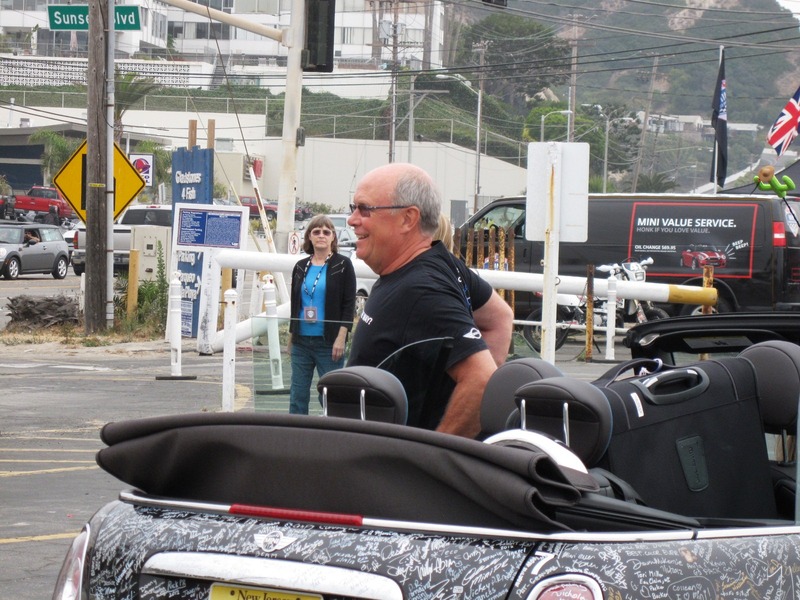 The little Black MINI driven by The Man himself, Jim McDowell. 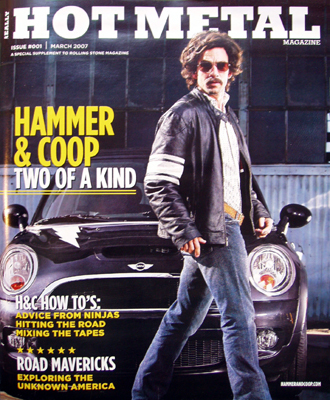 Several months back, I had read an article about him (Jim) and even shared it here on MidCal MINIs. And there he was, not more than 10 feet away from me. I remember reading about how much he enjoyed his job and that was no more so evident than when I saw him wheel up in the MINI at Gladstones. No job is stress free but imagine getting paid to drive a fabulous little car across the country and meeting up with people who share the same excitement, love and devotion for that car. He is the Piped Piper, the Johnny Apple Seed, the Walt Disney of the car world; the maker of magic. It was then time to head into Gladstones for fresh fruits, breads, muffins, juices, and coffee and to say goodbye to new and old MINI friends. 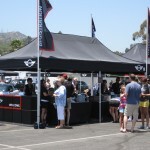 There were large MTTS badges given away as raffle prizes and the award of the big trip to the London Olympics and Paralympics, all of which was enhanced with the assistance of the California Beach cuties…. ok just say it, Eye Candy. And then, there was the water event. 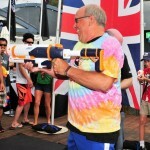 I had read stories about how Jim McDowell loves water guns and very much enjoys catching folks off guard. I had heard several from the cross-country drive talk about how during the trip Jim would pop out of nowhere and the water would fly. At one point I was walking around the impromptu stage area at Gladstones and nearly walked into a young man wearing what appeared to be a buffalo hat complete with horns and a very large water blaster! I immediately knew that Jim was about to get really wet. I momentarily thought about giving him a heads up but then I thought better and knew that he would enjoy it most of all. Needless to say he did not stay unarmed for long and revenge was swift. 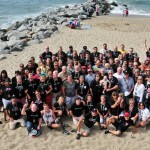 After the complete water soaking it was time for the 100 or so Motorers who had driven all of the way across the country to pose for a picture on the sandy beach of sunny California. And sunny it was. The high fog lifted and the sun came out just in time for the grand picture. I can only imagine that this group of MINI friends will stay in touch for numerous years to come. 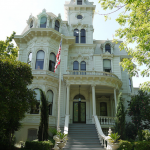 They had endured what has to be the hottest summer on record as they motored from coast to coast and yet they prevailed and made it all-the-way. Not only are they bonded by the love for a very special brand of car, they are connected through shared experiences. Yep, two years from now, the Sis and I need to make sure that we join in for more of MTTS. Note to self: To “H” with work, you only live once, it’s MTTS 2014 or bust! As they wrapped up the beach picture, we wandered back toward the parking lot. 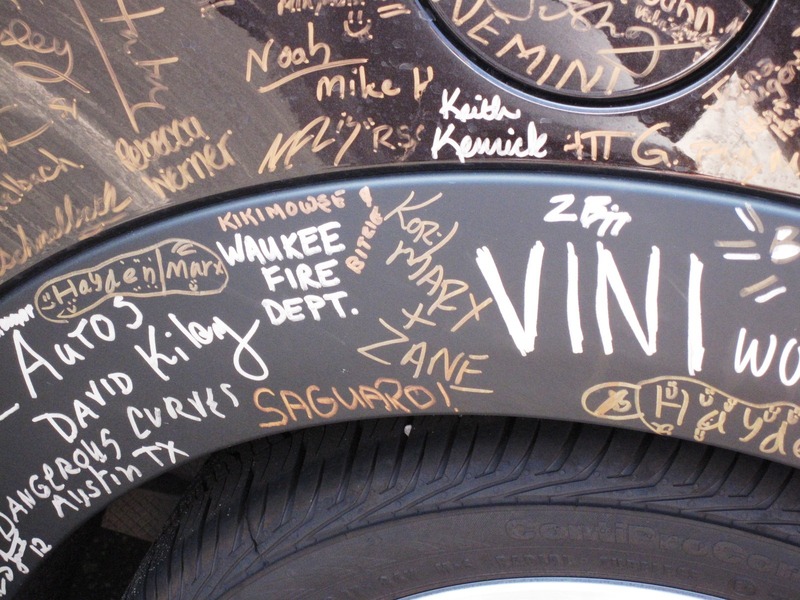 The little black MINI driven by Jim McDowell was parked next to the MINI bus with the gold and silver pens laid out for those who had not already signed the car, to do so. 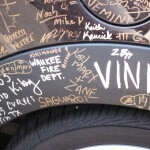 Not wasting any time, I grabbed one of the gold pens and left our mark, “KIKImowse and Bitzie” right next to the Waukee Fire Department of Iowa, the guys in uniform from Day Seven of the trip. Upon completion of the beach picture, it was time for all to head to the parking lot where we were told to stand next to our cars. While Bridget may have been adopted for the weekend, Bitzie and I will always have a soft spot in our hearts for our little silver minx. We hope that she remembers us as fondly as we do her and truly hope that she enjoyed being able to “ru b fenders” with so many other MINIs. 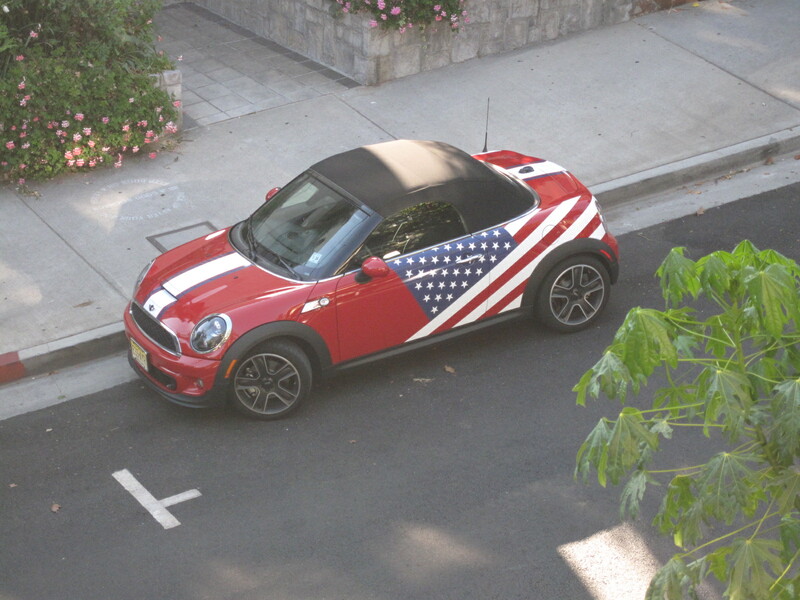 She even got to park next to the red Roadster wrapped with the American Flag. While we were waiting for the MINI wings overhead photo-op to be set up, I suddenly felt light sprinkles on my left arm. I looked up but did not see any clouds (no seagulls either thank goodness) and then I felt it again; on my legs this time. When I turned around, guess who was behind me? 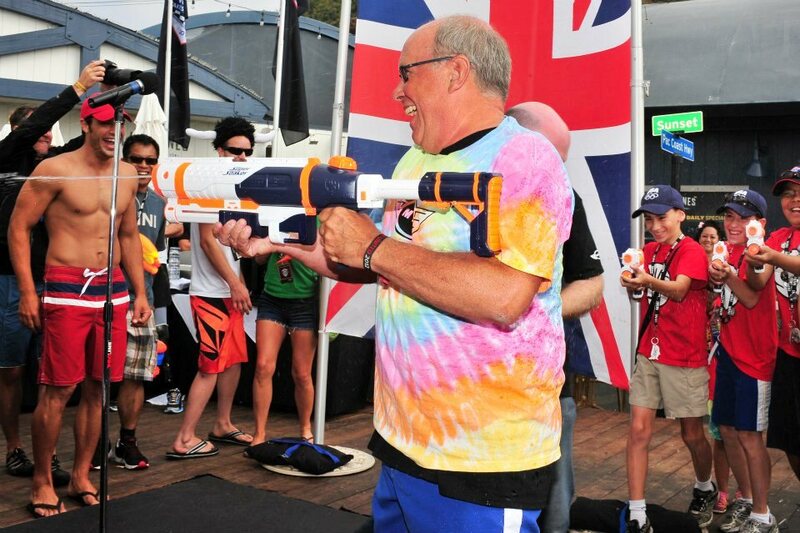 Yep, Jim McDowell with a water gun! 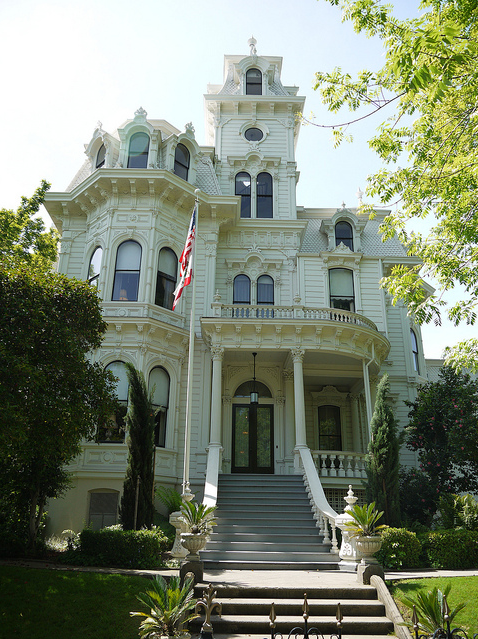 I had just been shot by THE MAN, and it was a privilege. Even Bridget got her tyre wet! 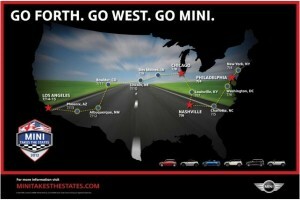 Well that is the end of our MTTS adventure. We drove Bridget down the PCH and dropped her off in Newport Beach, just in time to be detailed for her next adventure. Happy Motoring little Bridget. 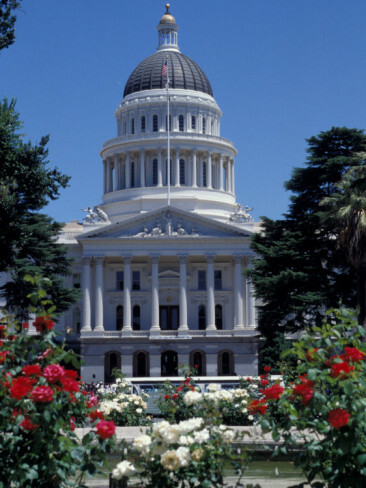 Oh and Jim, if you happen to ever see this post, we hope to see you in 2014; it’s at the top of our Bucket List! 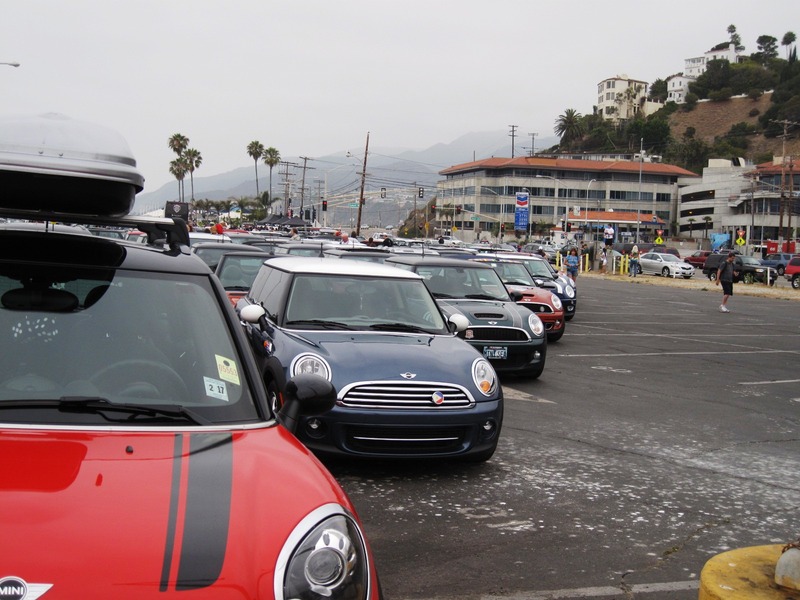 It is always such a kick to see so many MINIs in one location and for us MTTS 2012 enhanced the excitement further by ending the MTTS tour in Los Angeles. 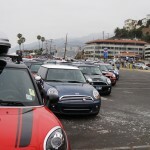 LA is loaded with MINIs anyway but to see so many at the Rose Bowl was terrific. Oh and the “Goodie Bags” for 2012 we received when checked in, well my MINI made out like a bandit! She now has two leather cleaning kits! Sis’s MINI has cloth seats, so MINImowse is set for life. Both kids also have new bling in the form of grille badges and pins for their dash covers. We even bought a third set for Reggie, my Dad’s 1995 Classic Mini. 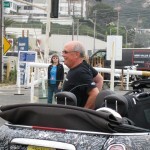 Bitzie and I both participated in the MINIcross and took the opportunity to test drive the Roadster and the Coupe. I found the windshield of the Roadster a bit on the low side for my liking. This is more than likely due to the fact that I am short and have to pull my seat so far forward in any car that I drive. As a result the visor seemed distracting for me. I also like my seat jacked up as tall as it can go. Someone taller that 5’4″ should not have any issues howe ver as they would have their seat lower and slid further back. (I remember years ago I wanted to test drive some little sports car and unless it came with blocks for the pedals and a booster seat, even with the seat as far forward as it could go, there was no way that car was going to work for me!) The Roadster handled very well and the interior was well-appointed and very comfortable. I just don’t think “my” model size was a good fit for the Roadster and I doubt that I will be have a growth spurt anytime soon. I also drove the Coupe which handled equally well, but to me it seem light and not as heavy as I like. Now that may sound funny, but I like the feel of solid heavy steering. 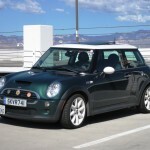 The Coupe seemed lighter to me and I did not find the steering as stiff or sports like. 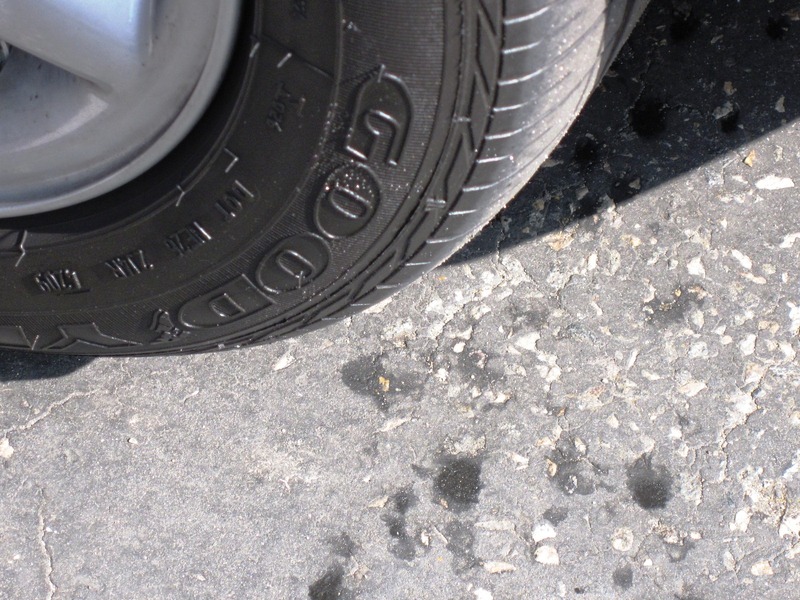 Again, I like stiff steering – just my preference, however. 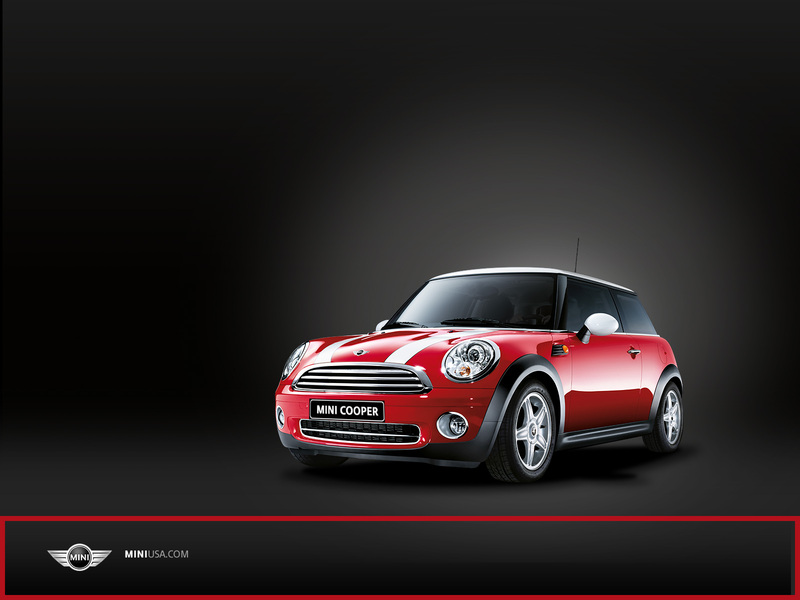 As they say, MINI makes numerous models and you just have to find the one that is right for you. MINImowse, my 07 Cabrio, and I have bonded for life. 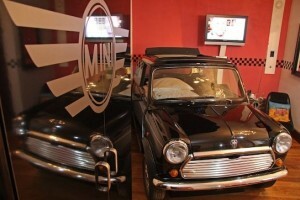 I still own my first ride, a 61 Bug and the last car that I owned before MINI, I drove for 20 years. MINImowse and I will finish out my driving years together. I chose a Cabrio so that when the day comes, I can very easily load my walker in (not for a very long time I hope). After taking a few spins around the MINIcross track we hit the booths for some power shopping and then it was off to find the Hotel. A little tricky to find but very nice and well worth the several times we drove around the block looking for the parking garage. More than likely the bride posing for pictures next to the driveway was distracting. 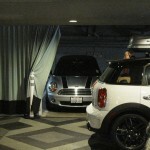 It never crossed our minds that a bride would be posing at the entrance to a parking garage. 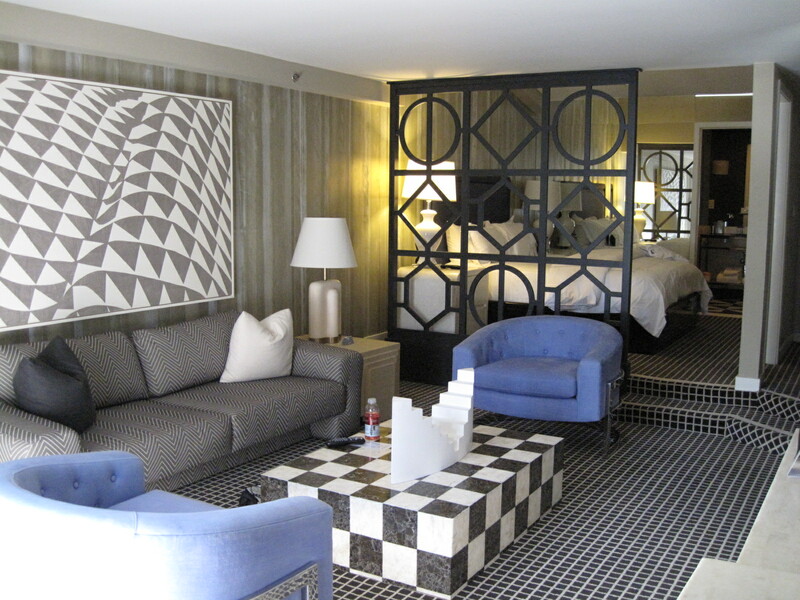 The hotel decor seemed most appropriate for a MINI event as the carpet in the room and the coffee table in particular reminded us of the checkered flag! As we relaxed and ordered room service waiting the evening wrap party to begin we stepped out on the balcony just in time to see numerous MINIs arrive after the long drive from Phoenix, Arizona. 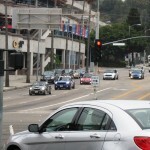 We even saw some of the very same cars that we had been watching on the MTTS Facebook page. 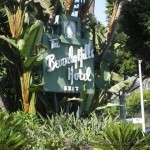 About twenty minutes before seven, we headed out from the hotel to walk the .6 miles to the House of Blues in West Hollywood on the famous Sunset Blvd; uphill nearly all the way. For two out of shape desk jockeys, this was quite the trek, but we did make it however. 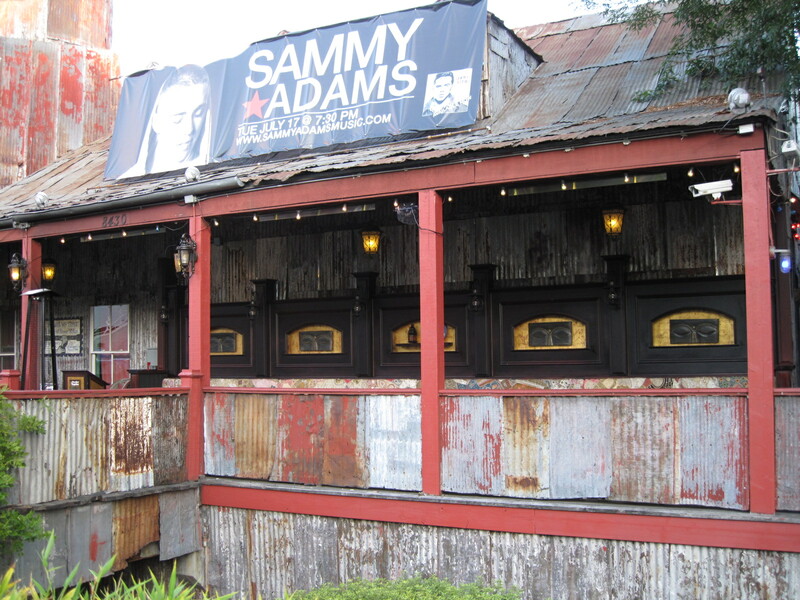 House of Blues Los Angeles opened in 1994 and is located in the heart of West Hollywood. 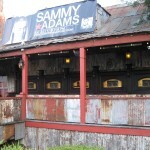 This location is home to unique pieces of art and architecture, such as work by Alan Sainte James Boudrot and Jake and Elwood movable bars. 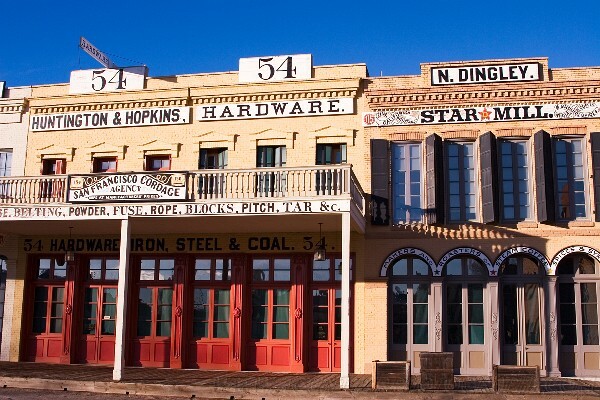 The Los Angeles venue is covered in tin from a gin mill that was just 500 feet away from the Delta crossroads — the mystical field where Robert Johnson created his famous partnership with the Devil for his soul. 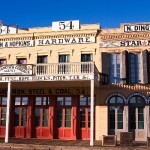 Notable acts that have played the House of Blues Los Angeles including the last live performance by Tupac Shakur and Prince with Maceo Parker. In keeping with tradition, the House of Blues Los Angeles displays the “Crazy Quilt” and keeps a metal box of mud from the Delta Mississippi underneath its stage. Matt Nathanson headlined the multi-talented, super bash at the MINI TAKES THE STATES 2012 LA WRAP Party. Known for hits like Wedding Dress, Faster, and the ever soulful, Come On Get Higher, Matt, with his folksy rock energy was a real kick! 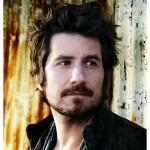 Recently known for his collaboration with acclaimed country music group Sugarland, you may have seen him with Christen in their performance of “Run” at the 2011 CMA show. 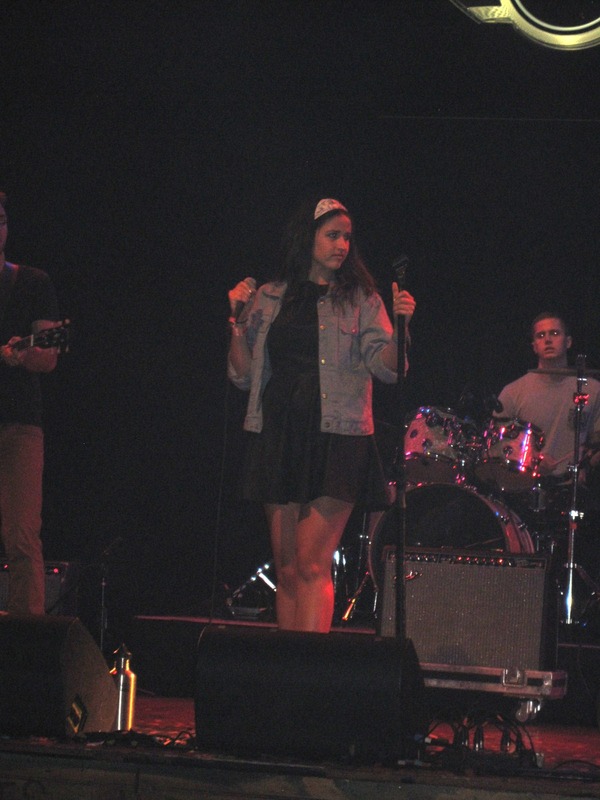 To get the party started, newcomer Rozzi Crane opened for Matt. 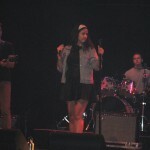 Rozzi is fresh off her mega contract signing with Maroon 5’s Adam Levine’s 222 Records. Dropping beats and spinning us through the night was NYC native DJ Rell. 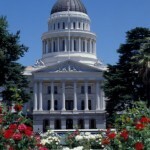 Rell was home schooled in the house of funk, soul and Motown and soon scratched his way to the Scratch DJ Academy in LA. DJ Rell worked his magic in-between sets and kept the crowd jumpin’ and bumpin’ all night long. 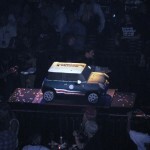 A highlight of the Wrap Party was what initially appeared to be a very large MINI Cooper Hardtop radio control car placed prominently to the side of the stage. 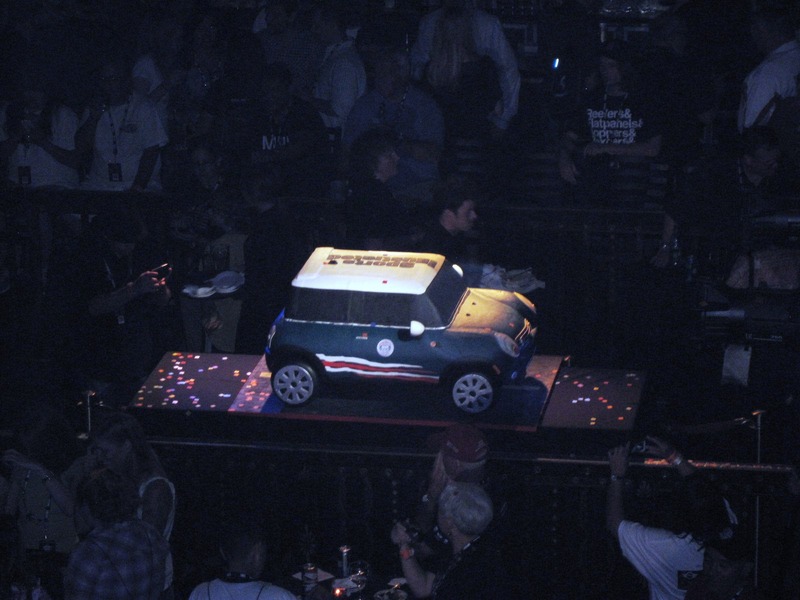 The car was provided by Sports illustrated, one of the event sponsors, and was to commemorated the 10th anniversary of the new MINI making its debut in the United States. 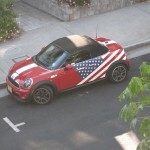 The little car even had a miniature MTTS badge on the doors. Upon getting closer to the car, it could be very clearly seen that rather than a radio control car, it was actually a cake! The detail was absolutely amazing. Near the end of the evening’s events the cake was cut and slices were handed out to the crowd. It was most surprising how moist the cake was. Often cakes that size, while cute, turn out to be rather dry and rather tasteless. Leave it to MINI, not only was it very moist, it tasted great! It consisted of several layers of white cake separated by a creamy light butter cream filling. Bitzie and I shared a slice which had been a of part of the white roof and the windshield. It was almost sad to see the little car go. Happy but sad must have been the emotions for many of those attending the Wrap Party. For over 100 of those at the event, this would be the last evening that they would be together. Twelve days, 3,877 miles, 16 states and and 13 cities and all of those MINIs. 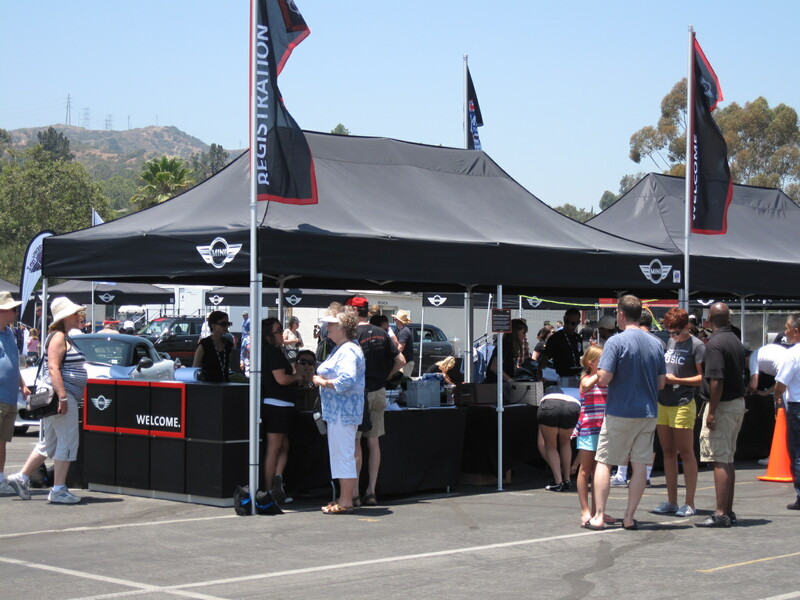 What other car company has such loyal owners, a special language, a secret wave, or for that matter, such an extended family of motorers? It’s a simple answer – none. 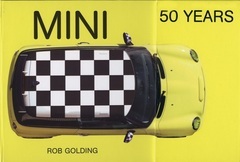 The love affair with the Mini began in 1959 and in spite of numerous company owners and major design modifications, the Mini/MINI spirit lives on. As the party wound down, Bitzie and I made our way back to the Hotel (all downhill thank goodness) and vowed that in 2014 we would be joining the MTTS once again, but this time for a lot more of the adventure; more miles and more cities.